In the United States, housing problems—in particular the growth of slums—became acute during the 19th cent. in the cities of the eastern seaboard and in the larger Midwestern cities. A leading cause was the heavy immigration from Europe that began in the middle of the 19th cent. and reached a peak at the turn of the century. The first housing law (the 1867 New York City tenement house law) was revised in 1879 to prohibit windowless rooms. The findings of a tenement house commission resulted in a new law in 1901, requiring better provision for light and ventilation, fire protection, and sanitation. Most U.S. city and state housing laws in the following years were based on those of New York City. Company Towns: 1880s to 1935In the 1890s, in remote locations such as railroad construction sites, lumber camps, turpentine camps, or coal mines, jobs often existed far from established towns. As a pragmatic solution, the employer sometimes developed a company town, where an individual company owned all the buildings and businesses. Contemporary Housing IssuesHousing has been an issue throughout American history, from urbanization to overcrowding. While this article does not provide an exhaustive list or analysis of all of America's issues related to this topic, gentrification, affordable housing, eviction, and homelessness are all issues that have risen to prominence in recent years. Defense Housing: 1942Speech by C.F. Palmer, Coordinator of Defense Housing. "In the twelve months ending next June 30th, we expect that an enormous army of two to three million men, women, and children will have been involved in the essential migration required by war industry and military concentration. The arrival of these millions of people in defense areas is creating a complexity of problems, in which the largest is the supply of shelter." 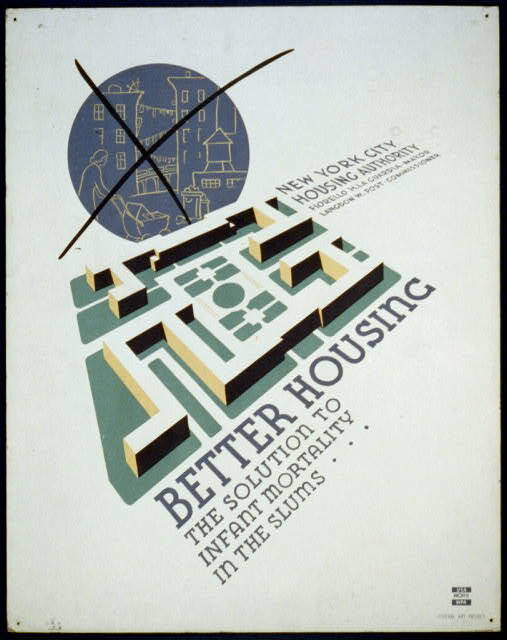 Housing and Politics (1940)Article written by Charles Abrams, appearing in Survey Graphic, 1940. "Low rent housing, resettlement, rural relief, soil conservation and reclamation, all these stand at the political crossroads today. The next few months may be decisive. What chance is there that public sentiment can lift these measures from their present position as experiments and stop-gaps into a realistic and adequate long range program?" Housing In The Depression: A Speech by Senator Robert F. Wagner 1936Address of the Honorable Robert F. Wagner, U.S. Senator, at the National Public Housing Conference, 1936. "They reflect our desire as a practical people to get at the essential. It is curious that our search for the essential has taken so many years to reach even the threshold of the housing problem. It has long been known that many of the evils confronting philanthropy and education are rooted in bad living conditions." I Visit a Housing Project: 1940Article written by Dorothy Canfield, appearing in Survey Graphic, 1940. "I don't know anything about housing problems, but I know what I like. What I wanted to find out was how I'd like it if the circumstances of my life should put me into one of these brand-new, queer-shaped, rather stark-looking, low cost housing projects, about which we all read more or less in the newspapers, and at which we crane our necks as we drive by and are told: "Look, that's one of the new federal building projects." Jacobs, Jane -- 1916 - 2006Jane Jacobs: An American-Canadian journalist, author, and activist known for her influence on urban studies and cities. National Housing Conference, IncFrom the 1940s to the 1960s, NHC consisted of a coalition of public housing advocates, social workers, labor unions, and local housing authorities who pushed for housing reforms. However, by the 1970s, NHC became an ally of the federal housing bureaucracy because its membership included primary builders, construction unions, and real estate developers. That "One Third of a Nation" (1940)Article by Edith Elmer Wood, appearing in Survey Graphic, 1940. "Equal opportunity which lies at the heart of democracy implies for every man, woman and child at least a sporting chance to attain health, decency and a normal family life. It was because the cards were stacked against a third of the nation that there had to be a new deal in housing." What Price Slum Clearance? (1953)Background Memorandum New York State Committee On Discrimination In Housing, 1953. "The City of New York has approved plans for the displacement of at least 45,000 families within the next three years as a result of urban redevelopment, public housing projects and other public improvements such as schools, roads and port authority projects...The elimination of slums and the creation of healthy neighborhoods are necessary and worthy objectives. In the process, however, the city has certain responsibilities and obligations to the displaced families as well as the city as a whole, to see to it that social benefit for one section of the population does not result in severe hardship for others."